Many women appreciate the aesthetic of a manicure and pedicure, but do you know what your nails are saying about your overall health? A trip to the manicurist is one of life’s simple pleasures — and for some women, a necessity. You come out feeling really ‘polished.’ But polished or not, your nails can provide clues to your general well-being. In traditional Chinese medicine, examination of the nails is part of the diagnostic procedure, and heeding changes in the nails can contribute to maintaining women’s health. 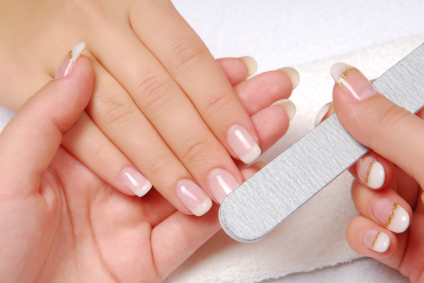 Your nails are made from the same protein as your hair, called keratin, and they grow out from under the cuticle. Healthy nails are smooth, and even-colored. On the average, it takes about six months for a nail to grow out from the cuticle to the tip of your finger. Your nails grow faster and stronger when you’re healthy. And when you’re not, they will show it. Hangnails are those little irritating pieces of dead, dry skin along the edges of a fingernail. Unsightly, but informative. If you have hangnails, you may need more vitamins or good oils in your diet. A hand cream with vitamin E and A is also helpful to keep the skin around your nails soft and supple. Vertical ridges (running the length of the nail) could show a possible iron deficiency, while horizontal ridges, could mean you need more calcium. Nails that split or peel again could be a vitamin A deficiency. Little white spots on the nail (not the ‘moon,’ which sits at the base of the nail) can indicate a lack of calcium or a zinc deficiency. Other discolorations in your nails, such as yellow, green or blue areas, could indicate more serious conditions, such as infection, disease or illness, and should be examined by a health care professional. For everyday nail health, a good multivitamin, or a multi-vite compiled specifically for hair and nails, can help keep your nails strong, smooth and attractive. Beautiful fingernails are actually an indication of a woman’s good health!